For the latest from director Richard Linklater, we head to 2017’s Last Flag Flying. 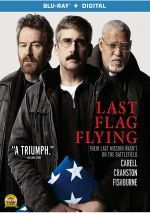 Set in late 2003, Larry "Doc" Shepherd (Steve Carell) reunites with Richard Mueller (Laurence Fishburne) and Sal Nealon (Bryan Cranston), two pals from his combat days in Vietnam. Doc doesn’t find his buddies for nostalgia, though. Doc’s son Larry Jr. recently died in Iraq, and he wants them to accompany him on a long drive to take the deceased Marine to his final resting place. Every year, a few movies look like surefire Academy Awards contenders but they don’t get there. These films show every sign that they’ll earn Oscar love but they fall short. Flag firmly falls into that category. All three of the lead actors have earned Oscar nominations, and Linklater enjoys five Academy nods. Add to that dramatic subject matter and award consideration seemed likely. Such consideration never came. Although Flag got generally good reviews, it failed to garner any nominations for the major awards. Which I can see. I think Flag brings a largely engaging “road trip” drama, but I can’t claim that it stands out as award-worthy. When Flag works, it does so mainly due to the charm of its leads, even though two of the three don’t offer objectively good work. As tends to be his wont, Cranston overacts and gobbles down scenery, while Carell brings too much Brick Tamland to his performance. This doesn’t mean I think either actor does poorly. However, I just feel Cranston could’ve toned down his act and Carell could’ve brought more dimensionality to his role. Unquestionably, Fishburne gives us the most honest work of the bunch. As a soldier who turned to God, Mueller seems like the best developed role in the film, and Fishburne adds a natural truth to the character. Even with these quibbles about Cranston and Carell, I think the three men add up to more than the sum of their parts. They interact in a natural manner and they bounce off each other in a winning way that makes the movie go by smoothly. A semi-sequel to 1973’s The Last Detail, the script for Flag becomes a minor liability. The characters’ interactions can lean toward speechifying, and these tendencies make it seem less believable than I’d like. On the other hand, the script does get into themes related to duty, honor and patriotism in a more subtle than expected manner. While we find too many scenes that feel pedantic, others deliver the message in an understated way. In the end, though, it’s the actors who carry the day. Their ease with each other turns Flag into a winning effort, even with the spotty moments. Last Flag Flying appears in an aspect ratio of approximately 1.85:1 on this Blu-ray Disc. The image fared nicely. Overall sharpness seemed positive. The occasional low-light shot veered a little soft, but the majority of the flick showed appropriate clarity and accuracy. The movie lacked shimmering or jaggies, and edge haloes remained absent. No print flaws cropped up here. Like many modern movies, Flag brought a palette heavy on teal along with some yellow and amber. The hues looked fine given these choices. Blacks were deep and tight, while shadows bright nice smoothness overall. I thought the transfer satisfied. With a strong character emphasis, the movie’s DTS-HD MA 5.1 lacked much ambition. It came with minimal score and effects tended toward general environmental information. That meant decent atmosphere on roads or in rain but not much stood out as involving. Audio quality appeared positive, with speech that seemed natural and concise. As noted, music didn’t provide much information, but the instances of score appeared clear and well-rendered. The same went for the fairly minimal use of effects. These seemed accurate and without distortion, but they sure didn’t tax my system. This wound up as a competent soundtrack. We get a smattering of extras here, and these start with a featurette called An Unexpected Journey. It runs 15 minutes, 48 seconds and involves co-writer/director Richard Linklater, executive producer Thomas Lee Wright, novelist/co-writer Daryl Ponicsan, editor Sandra Adair, and actors Laurence Fishburne, Steve Carell, J. Quinton Johnson, and Bryan Cranston. “Journey” looks at the source and its adaptation, story/characters, cast and performances, and Linklater’s impact on the production. This doesn’t become a deep view of the shoot, but it adds some good details. A collection of Outtakes fills nine minutes, 11 seconds. It shows a pretty standard set of goofs and giggles, one that lasts way too long to seem interesting. Three Deleted Scenes occupy a total of five minutes, 38 seconds. We find “Dress Blues” (1:27), “Limo Ride” (1:52) and “Extended Bar Scene” (2:19). “Blues” ruins a surprise during the climax, so I’m glad it got the boot. The other two give Sal more screentime, which he doesn’t really need, so they made sense as cuts, too. 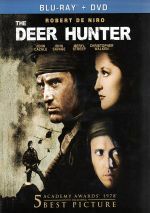 Finally, Veteran’s Day lasts five minutes, 41 seconds and features Cranston, Linklater, Fishburne, production designer Bruce Curtis, producer Ginger Sledge, key makeup artist Sharyn Cordice, head of security Sean Biagini, military advisor James Bane, and actors Bill Stalnaker, Tammy Tsai, Yul Vasquez and Cathy O’Dell. They reflect on the significance of shooting on Veteran’s Day in this honorable piece. The disc opens with ads for The Big Sick, Manchester By the Sea, The Wall and The Only Living Boy in New York. No trailer for Flag appears here. Due to the efforts of a good cast, Last Flag Flying turns into a largely engaging drama. It can sputter at times but the actors still keep us with it. The Blu-ray brings solid visuals along with acceptable audio and a handful of supplements. Though not a great film, Flag warrants a look.